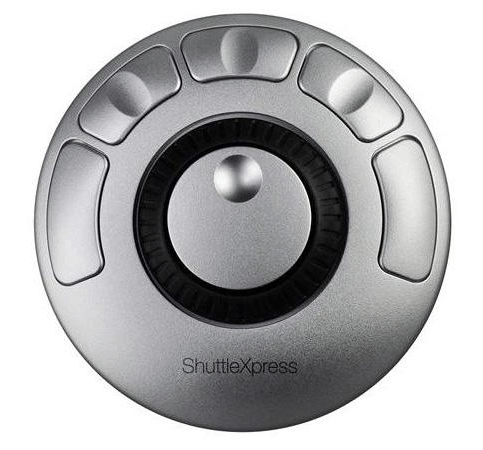 ShuttleXpress is a compact multi-media controller, based on the award-winning ShuttlePRO that gives you programmability and ergonomic control over most of today's popular multi-media applications. 5 oversized buttons can be pre-programmed for your audio and video editing tasks. Full jog capability lies with the jog wheel at the center of the wheel, putting complete capabilities in the palm of your hand. Working with any application that incorporates keyboard shortcuts, ShuttleXpress is the controller where less is more! Features: 5 fully programmable, large face easy to use buttons, 360 rotating job knob, rubberized shuttle wheel, compact design. Visit our online forum for updated application settings and the required drivers!